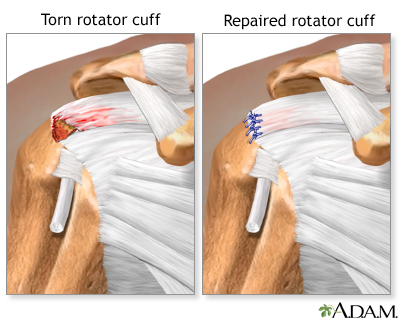 Rotator cuff repair is surgery to repair a torn tendon in the shoulder. The procedure can be done with a large (open) incision or with shoulder arthroscopy , which uses small buttonhole-sized incisions. 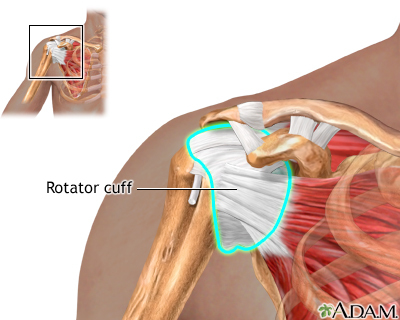 The rotator cuff is a group of muscles and tendons that form a cuff over the shoulder joint. These muscles and tendons hold the arm in its joint and help the shoulder joint to move. The tendons can be torn from overuse or injury. You will likely receive general anesthesia before this surgery. This means you will be asleep and unable to feel pain. Or, you will have regional anesthesia. Your arm and shoulder area will be numbed so that you do not feel any pain. If you receive regional anesthesia, you will also be given medicine to make you very sleepy during the operation. During open repair, a surgical incision is made and a large muscle (the deltoid) is gently moved out the way to do the surgery. Open repair is done for large or more complex tears. During mini-open repair, any damaged tissue or bone spurs are removed or repaired using an arthroscope. 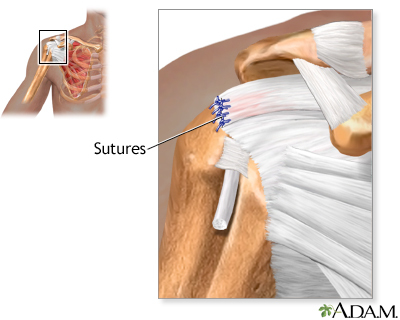 Then during the open part of the surgery, a 2- to 3-inch (5 to 7.5 centimeters) incision is made to repair the rotator cuff. The tendons are re-attached to the bone. Small rivets (called suture anchors) are often used to help attach the tendon to the bone. The suture anchors can be made of metal or material that dissolves over time, and do not need to be removed. Sutures (stitches) are attached to the anchors, which tie the tendon back to the bone. You have shoulder pain when you rest or at night, and it has not improved with exercises over 6 to 12 months. You are active and use your shoulder for sports or work. You have weakness and are unable to do everyday activities. You have a large or a complete rotator cuff tear. A tear was caused by a recent injury. The tendons of the rotator cuff were not already torn from chronic rotator cuff problems. A partial tear may not require surgery. Instead, rest and exercise are used to heal the shoulder. This approach is often best for people who do not place a lot of demand on their shoulder. Pain can be expected to improve. The tear may become larger over time. Tell your surgeon about any cold, flu, fever, herpes breakout, or other illness you may have before your surgery. Follow instructions on when to stop eating and drinking. Follow instructions on when to arrive at the hospital. Be sure to arrive on time. You will be wearing a sling when you leave the hospital. Some patients also wear a shoulder immobilizer. This keeps your shoulder from moving. How long you wear the sling or immobilizer will depend on the type of surgery you had. Recovery can take 4 to 6 months, depending on the size of the tear and other factors. You may have to wear a sling for 4 to 6 weeks after surgery. Pain is usually managed with medicines. Physical therapy can help you regain the motion and strength of your shoulder. The length of therapy will depend on the repair that was done. Follow instructions for any shoulder exercises you are told to do. Surgery to repair a torn rotator cuff is usually successful in relieving pain in the shoulder. The procedure may not always return strength to the shoulder. Rotator cuff repair can require a long recovery period, especially if the tear was large. When you can return to work or play sports depends on the surgery that was done. Expect several months to resume your regular activities. Some rotator cuff tears may not fully heal. Stiffness, weakness, and chronic pain may still be present. The rotator cuff was already torn or weak before the injury. After-surgery exercise and instructions are not followed. Older patients (over age 65). DeBerardino TM, Scordino L. Shoulder arthroscopy. In: Miller MD, Thompson SR, eds. DeLee and Drez's Orthopaedic Sports Medicine: Principles and Practice. 4th ed. Philadelphia, PA: Elsevier Saunders; 2015:chap 45. Miller RH III, Asar FM, Throckmorton TW. Shoulder and elbow injuries. In: Canale ST, Beaty JH, eds. Campbell's Operative Orthopaedics . Philadelphia, PA: Elsevier Mosby; 2013:chap 46. Sperling JW. Open rotator cuff replair. In: Cole BJ, Sekiya JK. Surgical Techniques of the Shoulder, Elbow, and Knee in Sports Medicine . 2nd ed. Philadelphia, PA: 2013:chap 24. Reviewed By: C. Benjamin Ma, MD, Assistant Professor, Chief, Sports Medicine and Shoulder Service, UCSF Department of Orthopaedic Surgery, San Francisco, CA. Also reviewed by David Zieve, MD, MHA, Bethanne Black, and the A.D.A.M. Editorial Team.